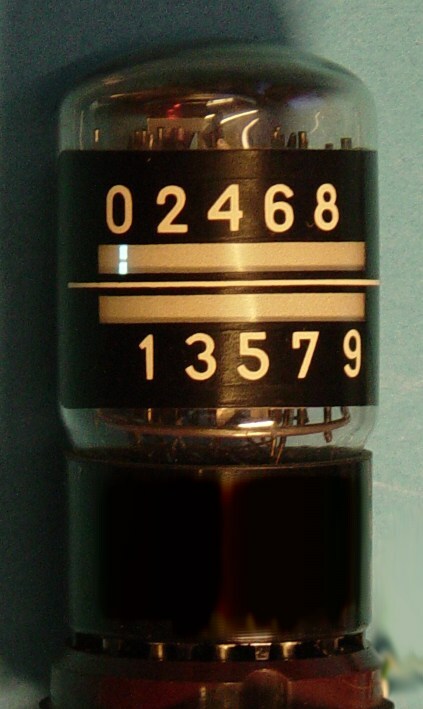 One of many technologies that predates Nixie tubes, these tiny CRT-like decade counter tubes toggle the position of a brightly lit blue/green rectangle from one digit to the next with a serial pulse input. 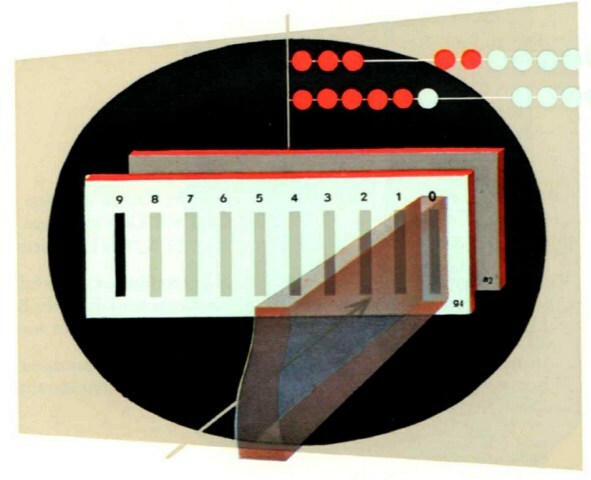 They were used in some early lab counters, and are visually very attractive when lit. 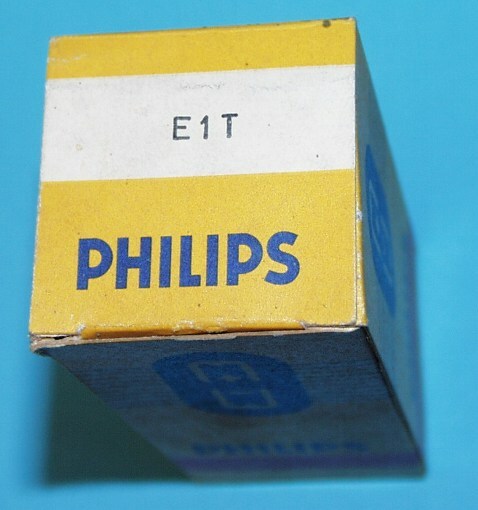 The E1T is an indirectly heated decade counting tube designed to operate at high counting speeds. 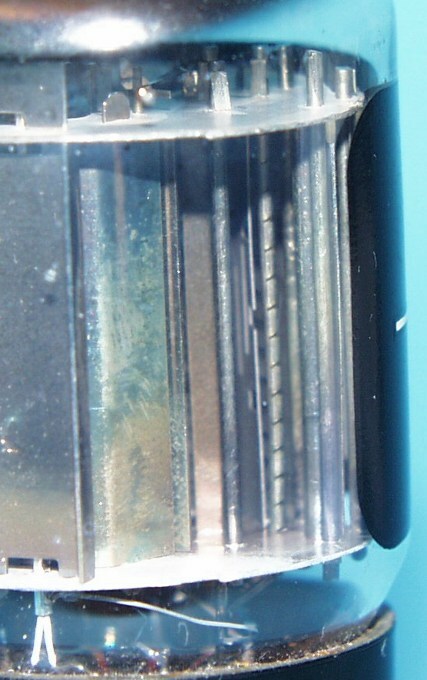 A ribbon shaped electron beam is moved in a horizontal plane and passes in succession through the ten apertures of a cylindrical anode and impinges on a fluorescent layer on the wall of the tube. 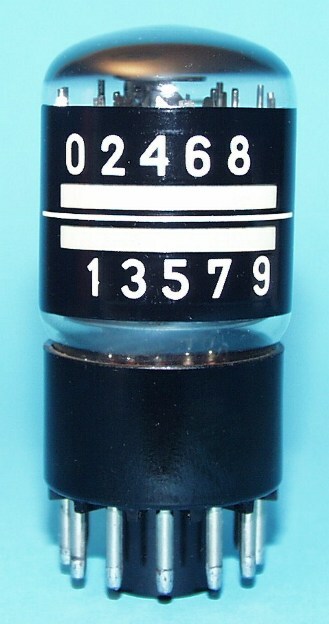 This tube was particularly suitable for use in computers. radiation counters and industrial counting and batching applications. 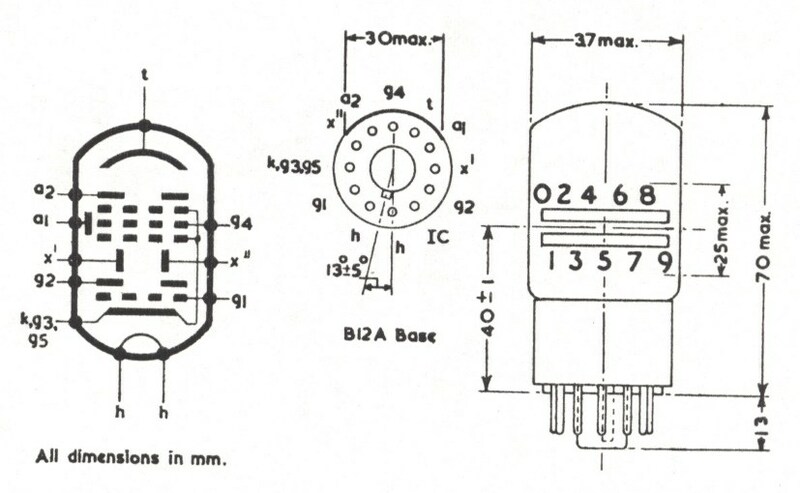 With the standard application circuit shown (see datasheets), the maximum counting speed is limited to 30 kHz. The tube can be mounted in any position except with tube horizontal and the fluorescent screen downward. 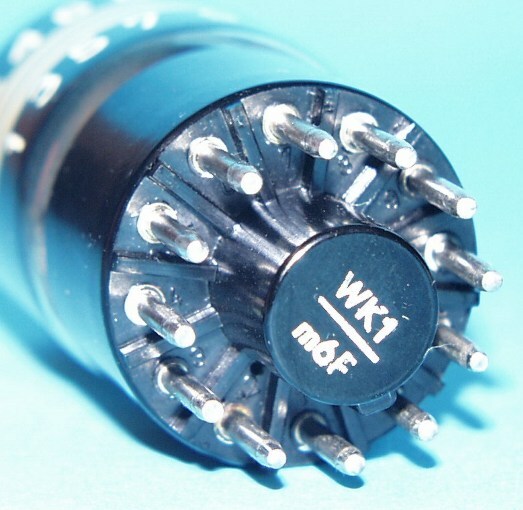 The operation of this tube can be influenced by external magnetic fields and for satisfactory operation the flux density of these fields should not exceed 2 gauss in any direction. The internal structure is shown in the diagram above. In order to move the ribbon beam from any one position to the next a pulse of correct shape must be applied to the left hand deflection plate. The amplitude of the pulse should have an average value of 13.6 volts and must lie between 11.5 volts and 15.5 volts. When the beam is moved on from the 9th position it will strike the reset anode a1. 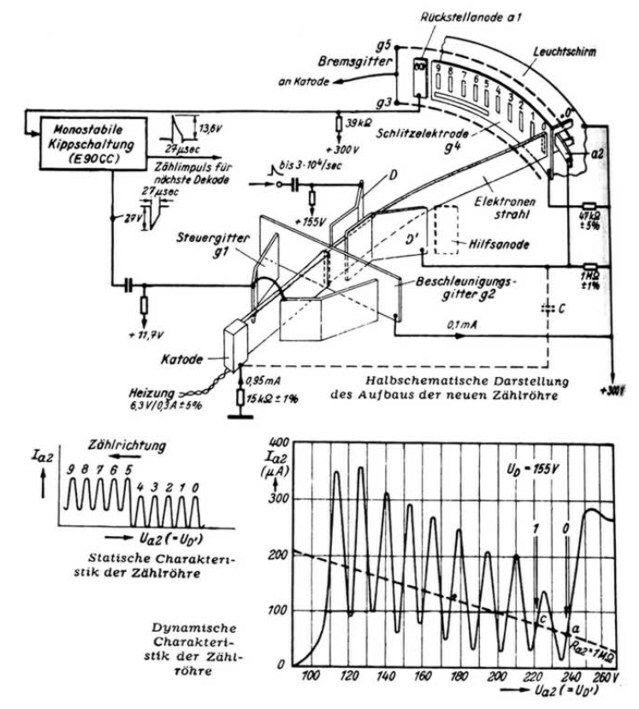 The negative pulse thus produced must be employed to generate two signals, one to reset the beam to its zero position and another to act as a counting pulse for the 2nd E1T in the counting chain. The reset pulse is negative going and is applied to the E1T control grid so that the tube is temporarily cut off. The minimum amplitude of the reset pulse must be 27 volts. The necessary reset time is a function of the circuit used and imposes the limit on maximum counting speed. However, if the reset pulse is too short the beam may return to an intermediate position instead of to the zero position. 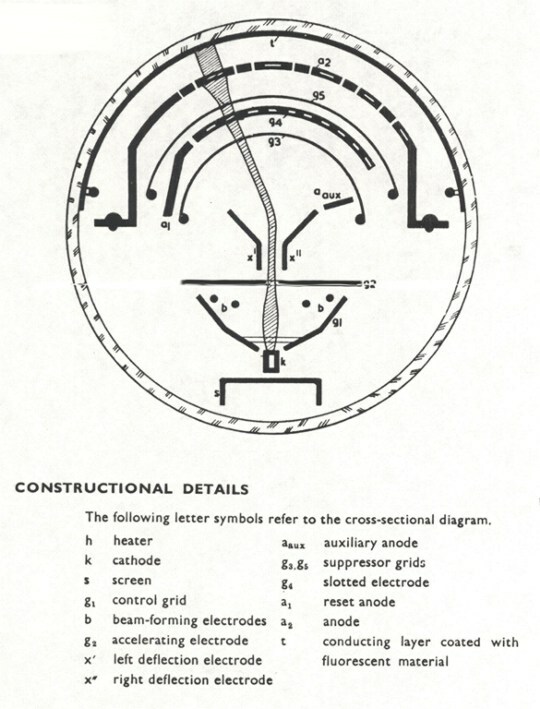 The connections to the base are shown above as is the operating appearance. 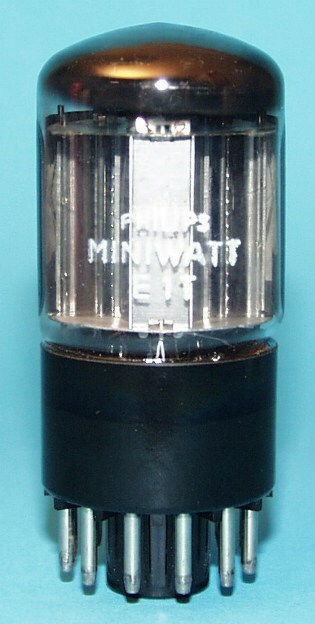 The wide glass tube envelope is 38 mm in diameter and excluding the base pins the valve is 67 mm long.